Triiodothyronine (T3) and weight loss are often discussed together for good reason! T3 is the most potent thyroid hormone that naturally revs up your metabolism. Far greater amounts of T3 are converted from thyroxine (T4) when your body wants to step up metabolism. Low T3 is associated with sluggish metabolism and many of the symptoms of hypothyroidism. Adequate T3 assists fat burning which is important for weight loss. It can also reduce many of the other symptoms of an under active thyroid. This thyroid hormone is also involved in stimulating energy production and protects against heart palpitations. In fact, low T3 can have far-reaching effects in the body. Reduced T3 activity is often associated with a slow heart rate, lower than normal body temperature, thyroid hair loss and chronic fatigue. A single T3 test of your T3 level therefore provides the best clue as to how your thyroid is working. If you are finding it hard to lose weight it is a good idea to discuss doing a free T3 test with your health practitioner. Should you get a T3 test? Getting a diagnosis of hypothyroidism has sparked an ongoing debate on what thyroid hormones should be tested and the levels that will reveal a thyroid hormone deficiency. A single test of thyroid stimulating hormone (TSH) is often the preferred test used by medical practitioners to diagnose a thyroid disorder. TSH is not actually produced in the thyroid. It is a hormone made by the pituitary gland which is located in the brain. When the pituitary releases TSH this hormone travels to the thyroid to stimulate the release of the thyroid hormones. The thyroid responds by getting busy making your thyroid hormones. When TSH is high this indicates the thyroid is functioning below par and therefore requires more stimulation than usual. The problem lies in defining a ‘normal’ range for TSH. I have found that even when TSH is considered ‘normal’ many individuals experience symptoms of hypothyroidism. A TSH test result should ideally be less than 2.0 mIU/L. An accurate assessment of thyroid health can only be achieved by testing 5 key thyroid hormones. A measure of both T4 and T3 along with TSH is therefore essential. 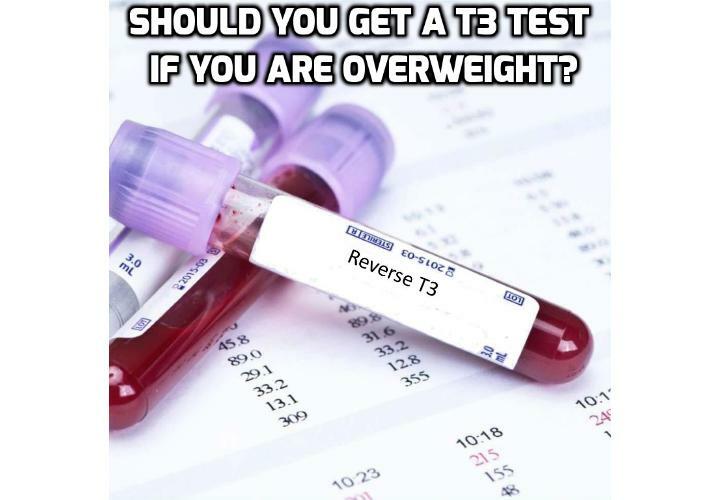 When discussing a T3 test with your doctor it is best to specify testing free T3. The majority of T3 in the blood is carried by a protein compound called thyroxine binding globulin. A small amount of T3 is unattached and ‘free’ to do its job. A T3 blood test usually measures both bound and free T3. When you test free T3 you are measuring the active component. Your T3 blood test result – What is considered a good number? The standard reference range for free T3 is 4.0-8.0 pmol/L. This provides a very good clue that you ideally want to see your free T3 test result above 4.0 pmol/L. If you are experiencing the typical signs and symptoms of an under active thyroid but your TSH, free T4, and even your free T3 appear to be normal you may want to consider checking your reverse T3. Should you test thyroid antibodies? A measure of thyroid antibody levels will rule out Hashimoto’s thyroiditis. This is a common thyroid autoimmune disorder that tends to run in families and affects women more than men. Previous PostPrevious Why Low T3 + T4 Can Trigger Thyroid Hair Loss? Next PostNext Why Knowing How to Calculate Your Reverse T3 Ratio Helps to Assess Overall Thyroid Health?